Glass Reinforced Polymer (GRP) handrail systems are perfectly suited to interior, exterior and aggressive environments where industrial chemicals or acid/salt air may quickly corrode metal systems. 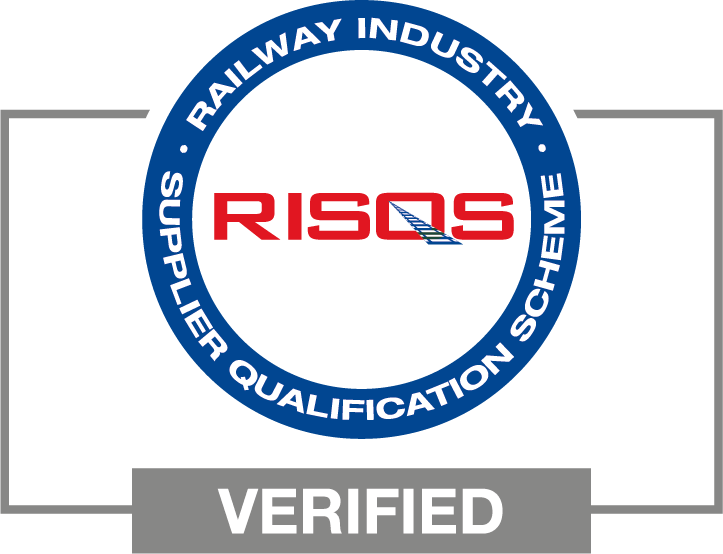 BS EN ISO 14122-3:2001 Safety of Machinery – Permanent means of access to machinery. Part 3: Stairways, stepladders & guard-rails. BS 6399-1:1996 Loading for buildings – Part 1: Code of practice for dead and imposed loads. Fire retardant – materials tested in accordance with EN 13501-1:2007. 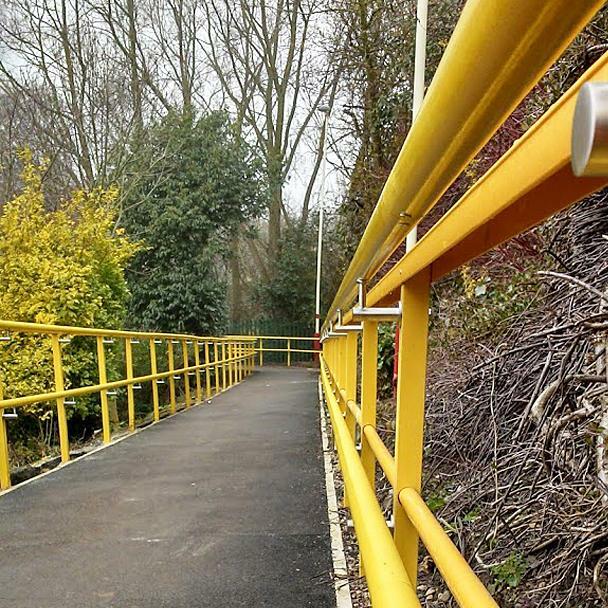 A profiled top, square section industrial Glass Reinforced Polymer (GRP) handrail is an extremely strong, yet cost-effective commercial rail system designed for use on platforms, walkways and staircases. Utilising a simple rivet connection assembly method, the system can be adapted to fit most requirements and provides a robust & rigid alternative to metal systems. 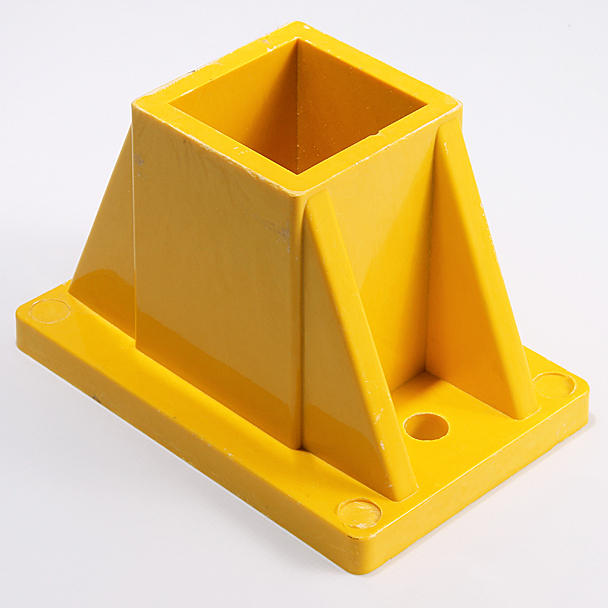 A tubular knee rail in matching or contrasting colour is employed below the wide, smooth channel top profile, with a kicker (toe) plate for added safety. 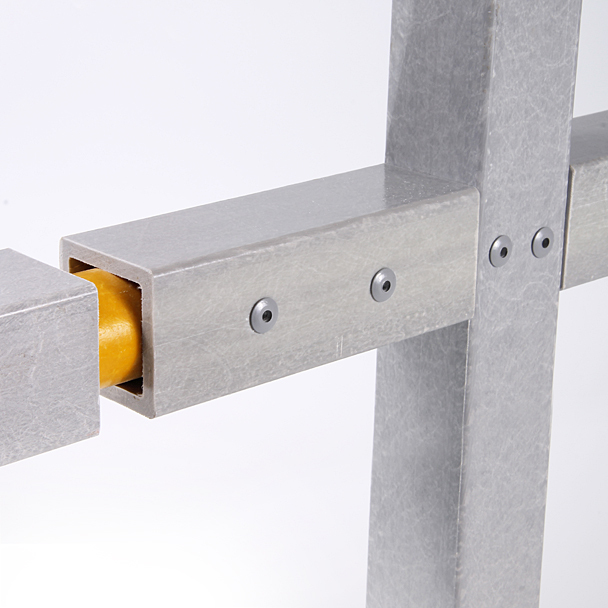 Square section GRP handrail systems are perfectly suited to an interior, exterior and aggressive environments where industrial chemicals or acid/salt air may quickly corrode metal systems. Commonly incorporated into new build & refurbishment designs alike, they have shown proven in-service performance for 40+ years. Handrails are manufactured from glass fibre & polyester resins by a process of pultrusion with an applied surface veil. 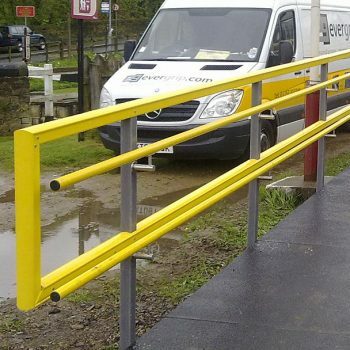 Available in a standard safety yellow (top profile & knee rail) and a choice of yellow or steel grey stanchions and kicker plate, GRP handrails provide all the advantages of lightweight, high strength and durability, coupled with corrosion resistant, non-conductive, fire retardant and virtually maintenance free life.